This is an example how creative advertisers can be. 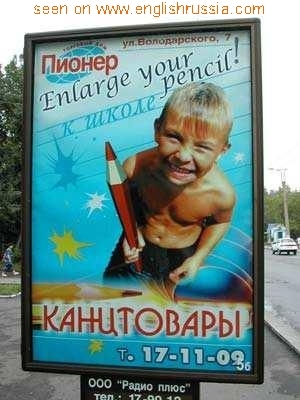 This commercial stand is from the streets of on Russian city, advertising the shop for different writing materials, for the beginning of the studying year in Russian schools. What made them to create such a stand? Too much of the spam in their inbox? it’s some small city coz there iz only 6 digits in tel. number. can you provide the original, before the english was added to the poster? I always read your amazing website every week, its great fun and got lots of interesting information to take in and lots of interesting articles.